Wether you are passing by or staying for a couple of days in an area, we always love an affordable accommodation. 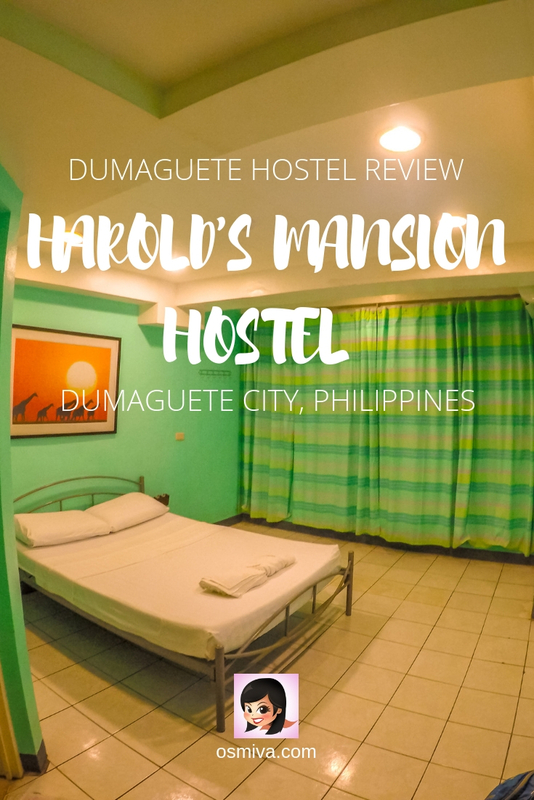 We found one cool and affordable hostel in Dumaguete to stay for the night: the Harolds Mansion Hostel. 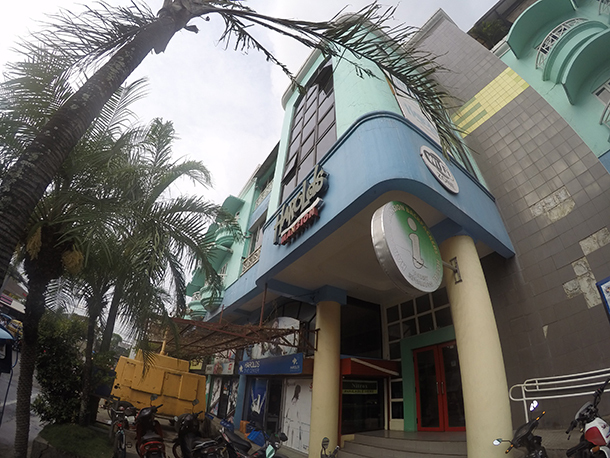 The hostel is a favourite among backpackers and divers.. Why? Well, Harolds Mansion offers affordable accommodation from private rooms to dorm rooms. They also offer scuba diving tours to the famous Apo Island! While we are not divers, we are avid fans of snorkelling. My husband and I wanted to swim with the sea turtles (an experience we did not get to do while in Moalboal) so I knew that a trip to Apo Island is inevitable. Good thing that Harolds Mansion also caters this type of tours for its guest. As we wanted convenience in getting to the tour the following day (registration time was at 6:30 AM), we booked at the Harolds Mansion the night before. Breakfast was already included so I think staying here was favourable for us. Being the over-planner that I am, I booked a room a month before our trip including the Apo Island Tour. I wanted a hassle-free trip so I pretty much booked everything and scheduled our itinerary ahead. LOL. Reserving for a room was pretty easy. I contacted the hostel via email and immediately got a reply for the booking confirmation. There was no reservation fee and no hassle at all. 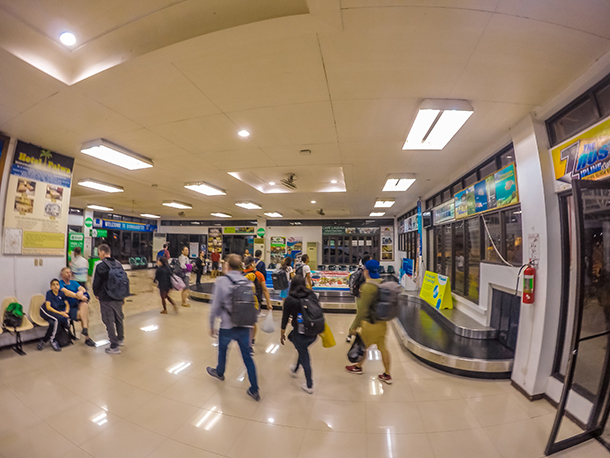 Our flight arrived in Dumaguete at 7 PM in the evening. The hostel offers pick-up at the airport but on the time of our arrival, there was no available driver to fetch us. Guess it was because it was already late in the evening. Nevertheless, they gave us directions on how to reach the hostel from the airport. Fortunately, we had no problem getting to the hostel. On our arrival, we immediately headed outside and looked for a tricycle to take us. Thankfully we have packed lightly thus saving us the time waiting for our baggage. 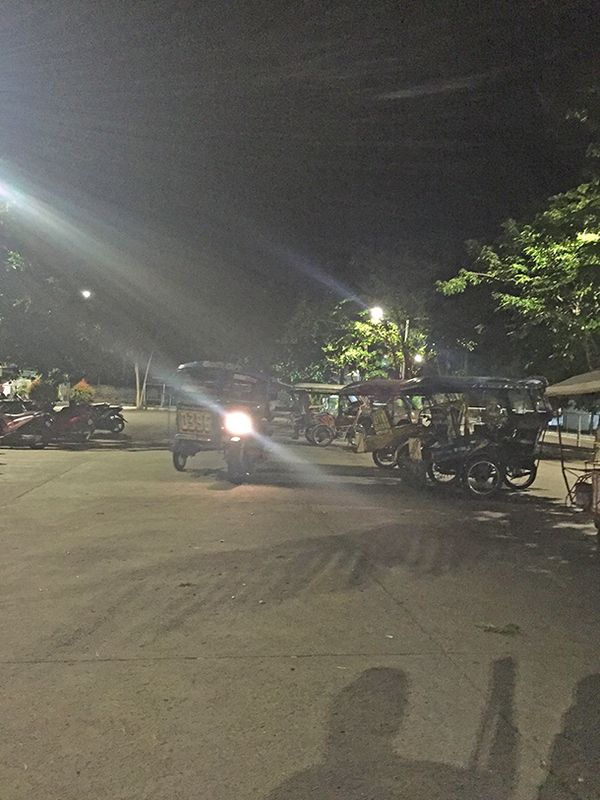 There were several drivers waiting at the entrance, each calling out if we wanted to hire them – they were mostly rent-a-car – so we just politely declined them and headed to the tricycle area. 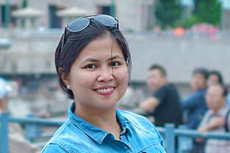 I’ve already inquired from a friend who have visited Dumaguete a few weeks before about the prices and best way to go to the city from the airport so it was with purpose that I went searching for the tricycles that can take me there cheaply. We finally had someone offer us a ride but it was for a habal-habal (motorcycle). Since we had some bags with us we declined and he gallantly referred us to his friend who drove a tricycle. From the airport, it took us about 7 minutes to reach the hostel. Agreed fare was 80 Php (1.55 USD) for the two (2) of us. Harolds Mansion is located at 205 Hibbard Avenue, Brgy. Looc, Dumaguete. It’s a tricycle away from the city centre and has several dining options nearby including the affordable Sta. Teresa Resto where we had our dinner two (2) nights after. Checking-In was also a breeze. We were greeted by two (2) of their staff at the reception area. We had to wait for a few minutes as there was a guest inquiring about some of the tours offered by the hostel. I took it as an opportunity to look around. The reception was a bit small and a little outdated. It was clean and had a homey feel to it. After a quick scan on their reservation log-book, inquiry about the Apo Island tour the following day and a few instructions and reminders, we were given keys to our room. As previously mentioned, the hostel had several rooms that they offer to guests. This includes a variety of air conditioned rooms, dorm rooms and fan rooms. The air conditioned rooms each has its own bathrooms while fan rooms can either be with a common bathroom or a private bathroom. For those on a budget, Harolds Mansion offers a bed and a room from 300 Php (dorm room) to 1,600 Php (air conditioned suite room). 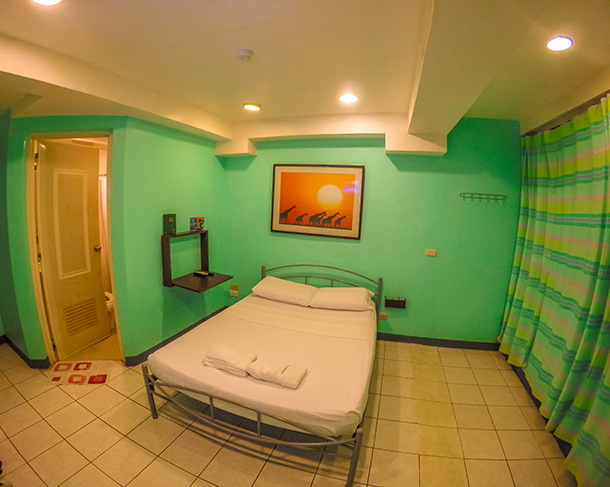 Since my husband is a light sleeper and we still wanted comfort and convenience, we booked an air conditioned double bed for 1,000 Php (19.38 USD). 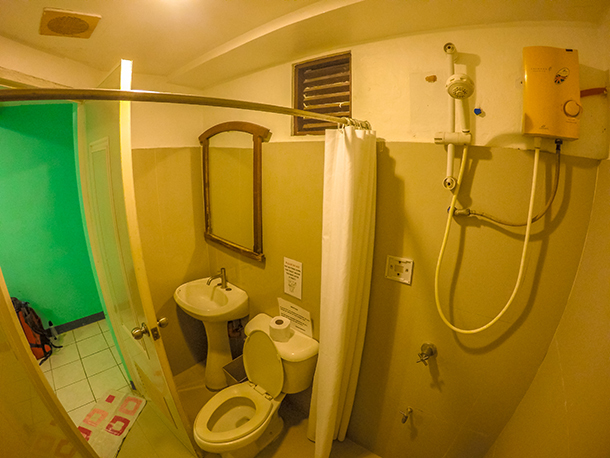 Our room had its own private bathroom (hot and cold shower included) and cabled television. The room was pretty spacious with minimal furnitures: just the bed and a foldable desk to put our things on. We were facing the highway so you can practically hear the sound of vehicles outside. Thankfully, the hostel is not located in the city centre and Dumaguete is pretty peaceful in general, so there was no annoying sound at night. We had to leave our IDs at the reception area to be given towels to use in the room. Toiletries like soap, shampoo and toothpaste were not included. Nevertheless, I had brought with me our toiletries. Good thing too that there was a roll of tissue available at the bathroom that we can use. The hostel’s dining area is located at the rooftop. It’s a dining area/ common area in one. 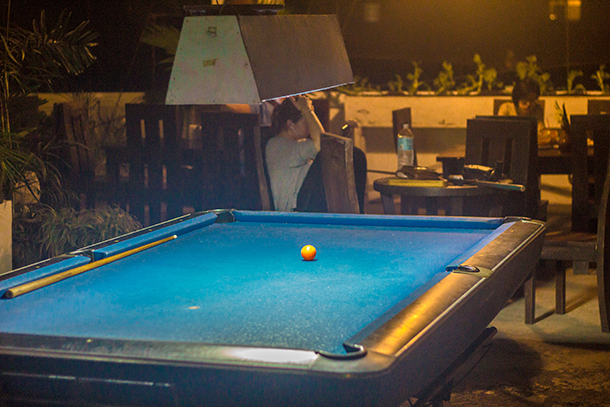 There are tables and chairs as well as a billiards table at the centre for those wanting to play. It’s for free so you jut have to with for your turn if you’d like to use it. At first, we attempted to look for a place to eat outside. But we were tired and decided to eat at the rooftop. 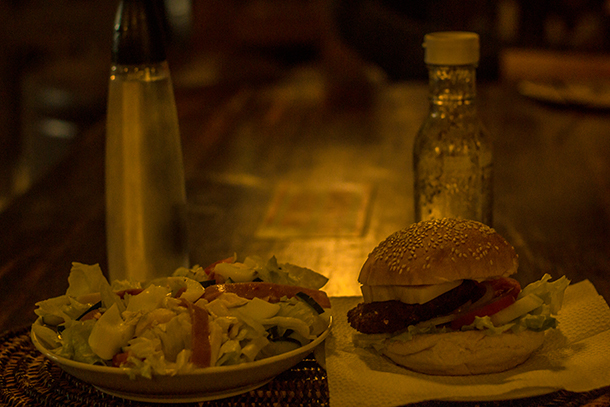 The food was not expensive at all and they serve huge portions so the burger and salad we ordered was pretty much enough for the two (2) of us. We retired at around 9PM as we will be waking up pretty early the following morning. By 6AM, my husband and I proceeded to the rooftop in the hopes to have breakfast before starting out with the tour. Unfortunately, breakfast is served at 6:30 AM and we just can’t wait as registration was also at 6:30 AM. Thankfully, they serve coffee (it’s free flowing by the way, including water) and some freshly baked bread. 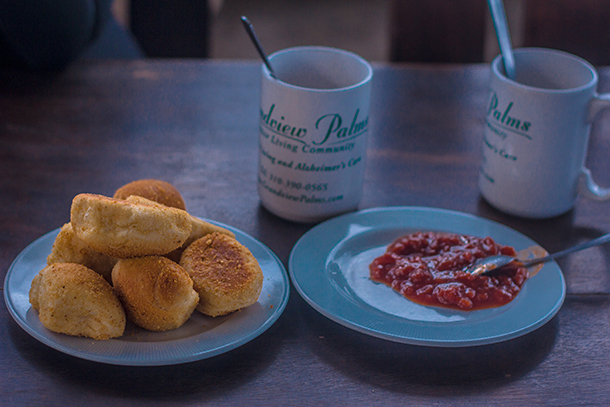 So we settled with that including some home-made jam. By 6:20 we were all set and pretty full. We already had all our things with us and just proceeded directly to the reception for check out. Check out was also no hassle at all. The hostel also allows guests to leave their things for safekeeping when going on a tour with them. So we left most of our bags and only carried with us our essentials for the island hopping trip. 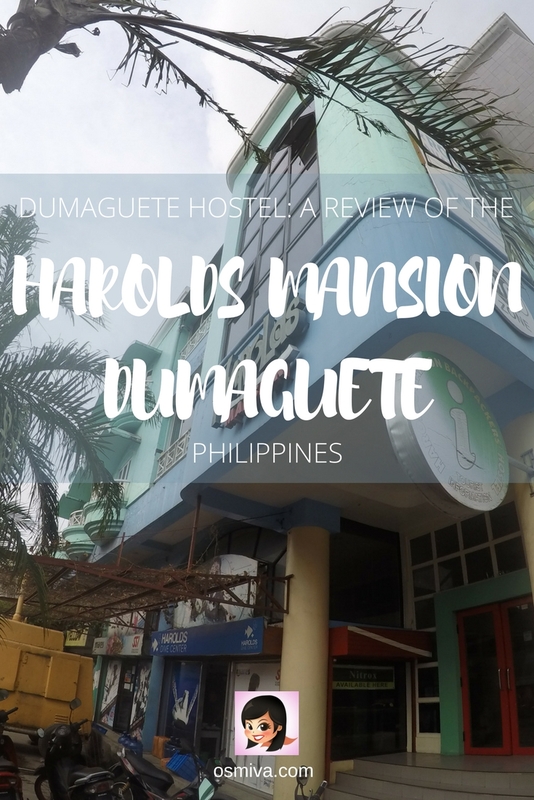 Over-all, Harolds Mansion offered a pleasant experience for those wanting an affordable stay where you can socialise and essentially book tours to various points of interest in Dumaguete. Watch out for my review of our Apo Island Tour experience with Harolds Dive Centre! It’s always great to find a beautiful place to stay that’s also affordable and fun! I would also love to swim with sea turtles, what an amazing experience, this hotel looks ideally placed for that. Love the colourful bedroom too. This looks like a comfortable and convenient place when one wants to save on accommodation. The bedroom is so bright! What flavour was the jam? I’m not crazy about the food, but everything else looks amazing. Would definitely try for a few weeks to come visit. Looks like a brilliant place to stay! I just passed through Dumaguete once on my way to the sandbars! The property definitely looks lovely. Often when I read through the reviews of the properties, I find them totally focused on the premises itself. I love the fact how you have included details like how to reach here, which will definitely help readers make their decision to stay here.